In the year 1288, Scotland established this day in history–Leap Year–and only this day, as one when a woman could propose marriage to a man. In the event he refused the proposal, the man was required to pay a fine. Historically, cultural norms have always dictated the unwritten rules of courtship. And until very recently, only men were deemed the appropriate party to propose marriage to a woman. But, it turns out, women have been complaining for centuries about how long it takes men to propose. According to legend, in 5th century Ireland, St. Bridget complained to St. Patrick about women having to wait so long for a man to propose. St. Patrick at once remedied the situation with a leap-year loophole. He declared 29 February, occurring every four years during a leap year, a day that women could propose to men. Scotland became the first to codify St. Patrick’s declaration into law in 1288. As Scots reasoned, the leap year day was put in place to fix a problem in the calendar. As such, it could also be used to fix a problem in an outdated and unfair set of cultural norms dictating courtship practices. According to the Scottish law, any man who declined a proposal in a leap year must pay a fine, ranging from a kiss to a pair of gloves to a silk dress to £100. The leap year legend spread and soon polite society was holding leap year balls and leap year dances, organised for women to ask men to dance and to ask for a man’s hand in marriage. In the US, the tradition evolved into Sadie Hawkins Day, named after the man-chasing character in the Al Capp cartoon strip Li’l Abner and held in November. Though the day is different than the original Scottish rendition, the practice is the same: women pursue men, for a date or for marriage. Thanks perhaps partly to the Scottish law of 1288, today many women need not wait for the leap year to propose to the man of their choice. 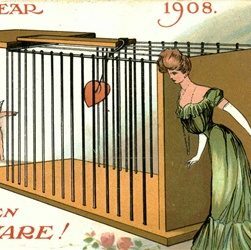 Photo Caption: A leap year postcard depicts a woman enticing a man into a mousetrap.